Crock Pot Picadillo Stuffed Peppers use a delicious Picadillo Beef Mixture and make it into stuffed peppers, now that sounds so tasty! Click here to see Ten Tasty Instant Pot Stuffed Peppers Recipes! Click here to see The BEST Slow Cooker Dinners with Ground Beef! Doesn’t everyone love the idea of taking delicious leftovers and turning them into another great meal? That’s what my friend Gina did in this recipe for Crock Pot Picadillo Stuffed Peppers from Skinnytaste, and I love the sound of Picadillo Beef used in a stuffed pepper mixture. And this is made entirely from leftovers, so you’re getting two dinner ideas here, and it’s quick to get into the slow cooker! 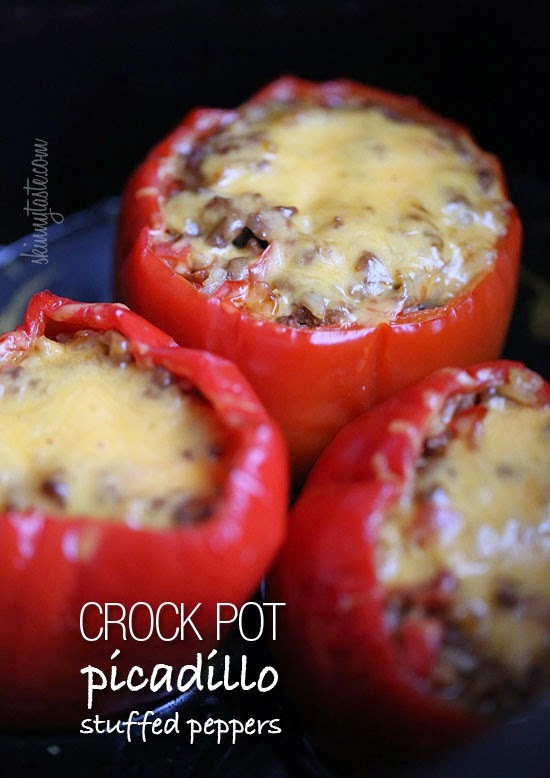 Get complete instructions for Crock Pot Picadillo Stuffed Peppers from Skinnytaste. Use the Index Page for Vegetables to see all the slow cooker vegetable recipes that have been featured on this site.